All About UsWho we are - what we do! 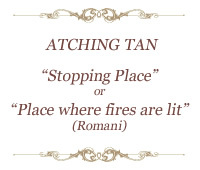 Following the broadcast of the highly successful pilot episode of Atching Tan on BBC Three Counties Radio in January 2007, the Romany Theatre Company (RTC) was commissioned by BBC East to produce 36 fifteen minute episodes of the radio drama series to run from 2008 to 2010. Atching Tan is an exciting drama series that explores the relationships between members of the Gypsy, Romany and Traveller and settled communities. The first series was broadcast between October and December 2008 by BBC local radio stations across the east of England. Atching Tan has received extremely positive reviews for its insightful drama, whilst the BBC has provided generous support to help develop its new writing talent, all of whom come from Traveller backgrounds. Half of the cast are also Gypsy, Romany, Travellers. The second series ran on the BBC from 12 October 2009 on BBC Three Counties. RTC aims to break down the barriers of mistrust and misconception that exist between the Gypsy, Romany and Traveller and settled communities while nurturing talent using the medium of drama. ‘It’s fantastic having Gypsy, Romany, Travellers write and perform their own radio drama. A creative and exciting way to build better understanding between communities and highlight exciting new talent.’ Dan Allum – Director of RTC and creator of Atching Tan.